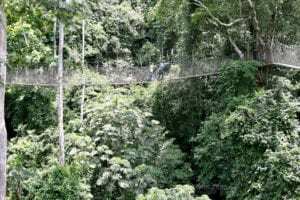 Welcome to Ghana’s most visited attraction, the Kakum National Park. 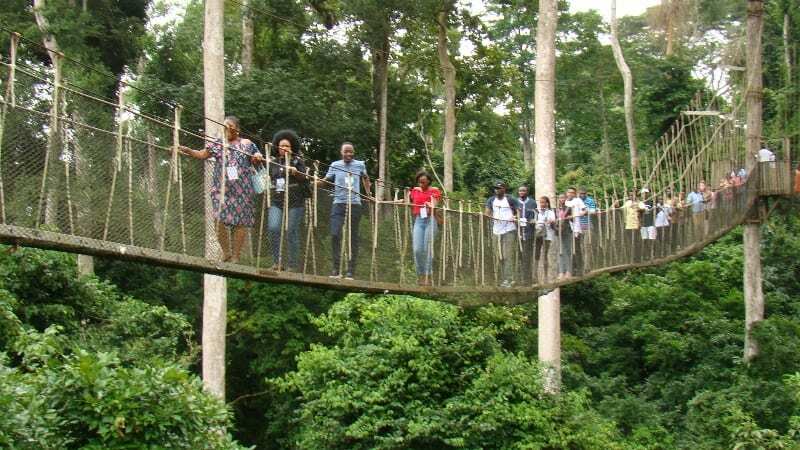 Tucked away in the Assin Attandanso Reserve is the Kakum National Park and Canopy Walkway that offers visitors spectacular scenery and a fascinating wildlife experience along with modern camping facilities. 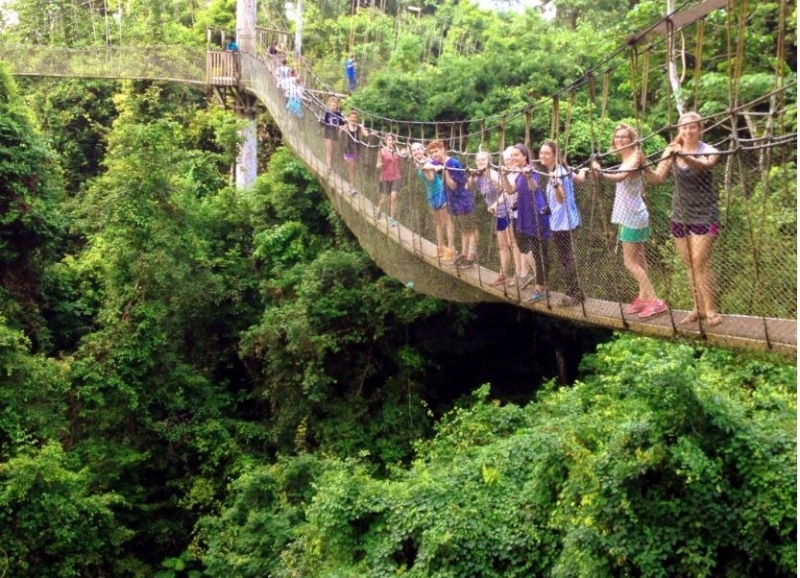 The park’s best-known feature is undoubtedly its 7 suspension bridges which form a 333-meter long canopy walkway, suspended up to 27 meters above the forest floor from trees that are over 300 years old. 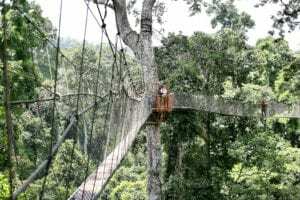 The canopy walk is only one of Kakum’s many delights. 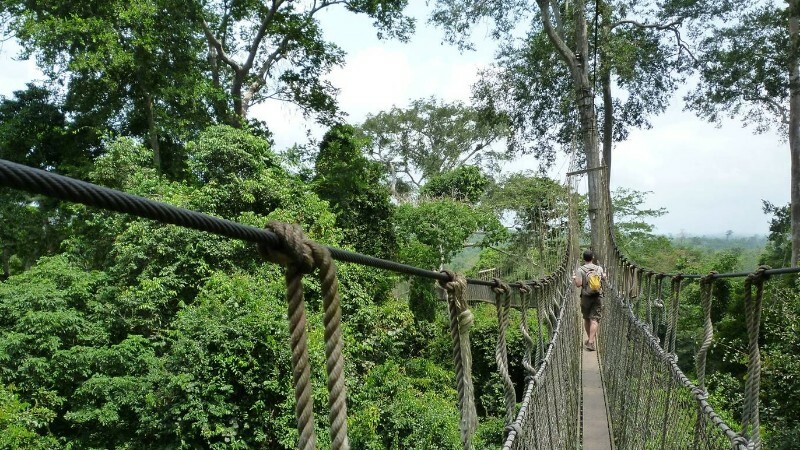 There are a variety of trails and guided walks that allow visitors to experience the solitude of the rainforest. 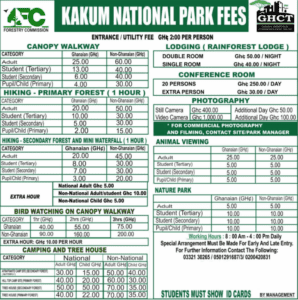 It’s also a premier site for bird watchers, with over 300 species including eight species of global conservation concern. 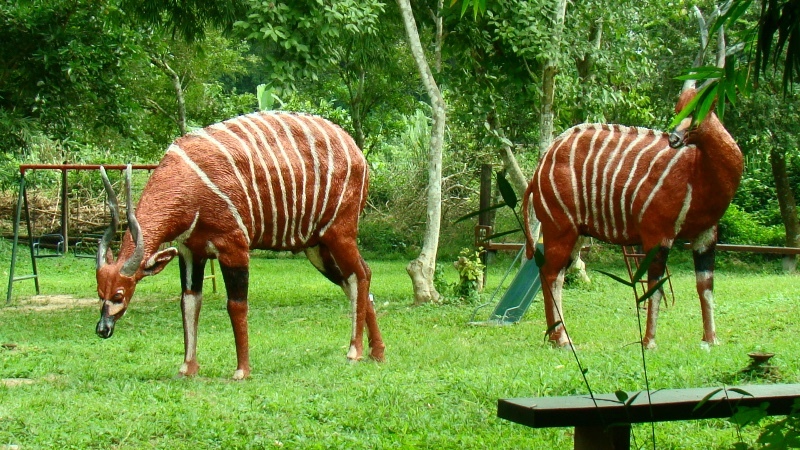 Mammals include forest elephant, leopard, bongo, bushbuck and many primates, but game viewing is difficult. Also, more than 600 butterfly species have been recorded. The forest has wild life which can be seen in the night and professional guides are always available to take you on a guided night tour. 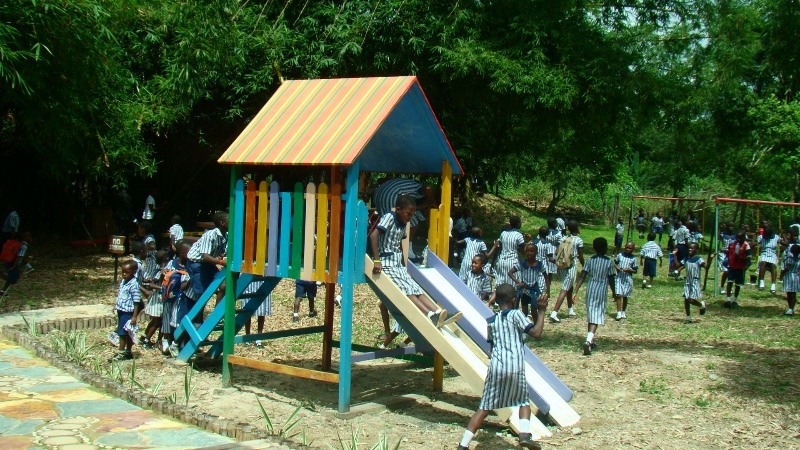 The park is child-friendly so don’t forget to take the kids along to the newly added children’s park with a super mini and safe canopy walkway swings and play area. Remember, this is a rain forest and it can rain at any time, go with your rain coat and your trainer. It is best not to carry any heavy thing in your hands since you will be needing your hands to hold the ropes on both sides as you walk along. Carry a small backpack or a waist bag where you may keep your camera or phone on top of the walkway. 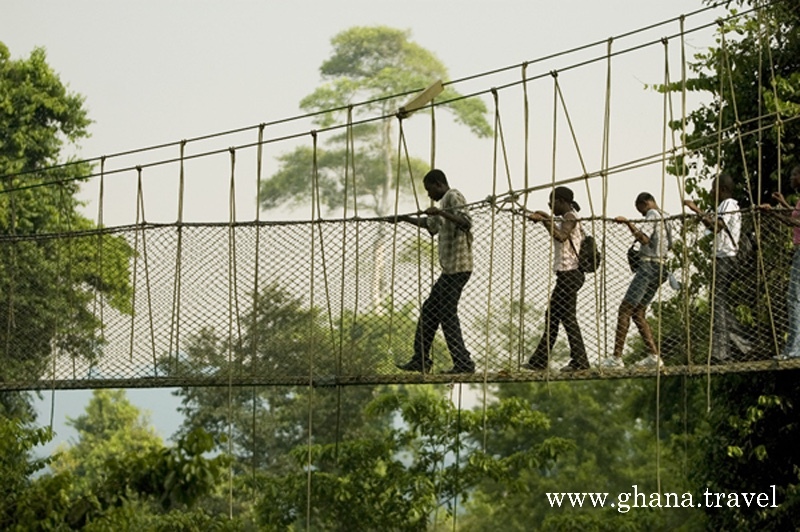 There is a brief hike before reaching the Bridges. Make sure you wear good shoes. 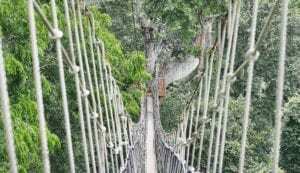 Kakum is about 4hours drive from Accra. Its advisable you go by your own pre-arranged transport means. 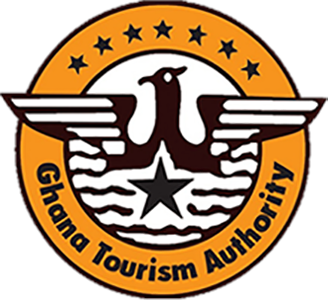 You may also go by public transport and connect from Cape Coast. 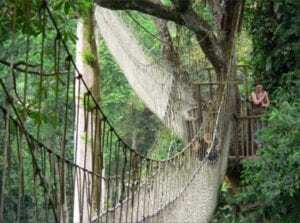 There is a treehouse for you if wish to stay the night for bird and wildlife watching. 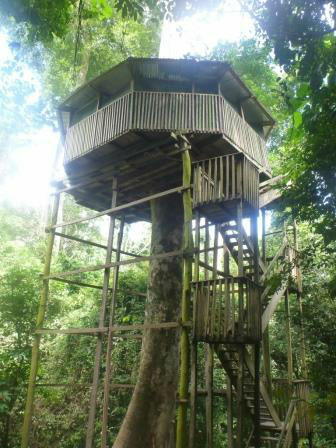 The treehouse is fitted with mattresses, bedding, and mosquito nets and comfortable for anyone who is accustomed to camping. There is also an outhouse. 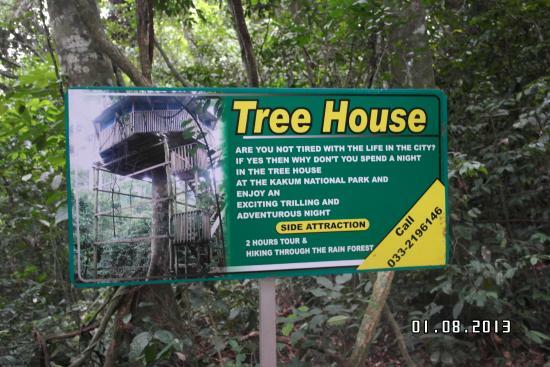 tree top accommodation for anyone who wish to stay the night for the love of animals. 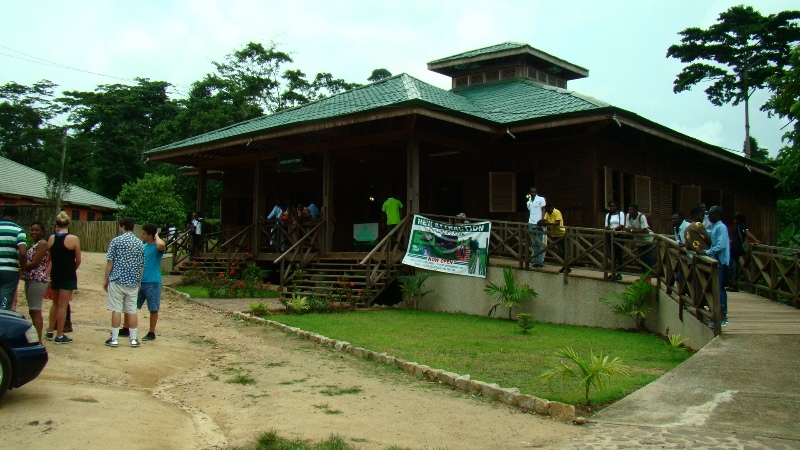 There are two cafes at the visitor centre serving basic food, snacks and fresh juices. You can also get from around the car park fresh coconuts, “sobolo” –bisap (purple drink made from water and hibiscus leaves) and bottled water. Ask from the forest restaurant for the local meal, ‘fufu’ and goat light soup to be prepared as you go for the walk so that by time you return, your meal will be ready and waiting for you. 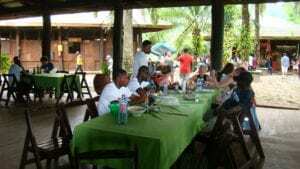 You may enjoy other such as Jollof rice. 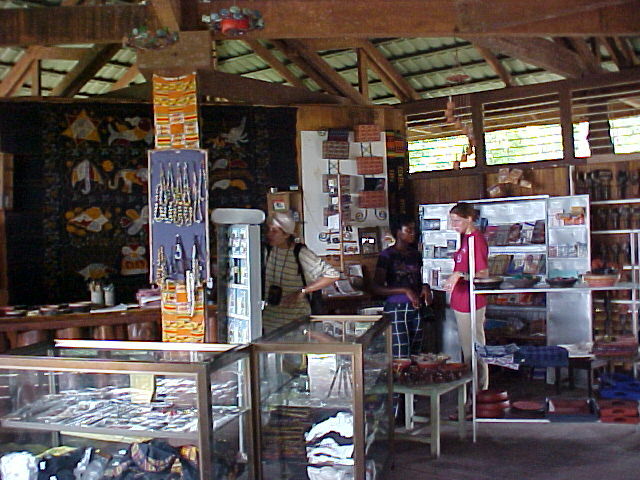 The visitor center has all kinds of exhibits, plus an open-air restaurant and a gift shop operated by Aid to Artisans Ghana.